When I started this blog, I didn’t take much care about internal links. I used to write posts keeping all on page SEO tips in my mind, followed by the few backlinks on the related sites back to my post. In order to have a proper user navigation, I started having my posts in sidebar, I didn’t know that internal links play an important role in terms of search engine optimization, however I realized soon when my traffic increased a bit for the posts, I had in sidebar. With the above experience I got to know that internal link is one of the most important SEO factor which you must take care. Let’s not bore you with my initial days stories and few silly and novice experiments. I’m here to talk about a very useful WordPress plugin Insights. 4) Search for Images, Videos, News, blogs and Books – As you can already see in the above screenshots that apart from myblog, Google & wiki their are other options to select such as Flickr images, YouTube videos, Google maps and more. 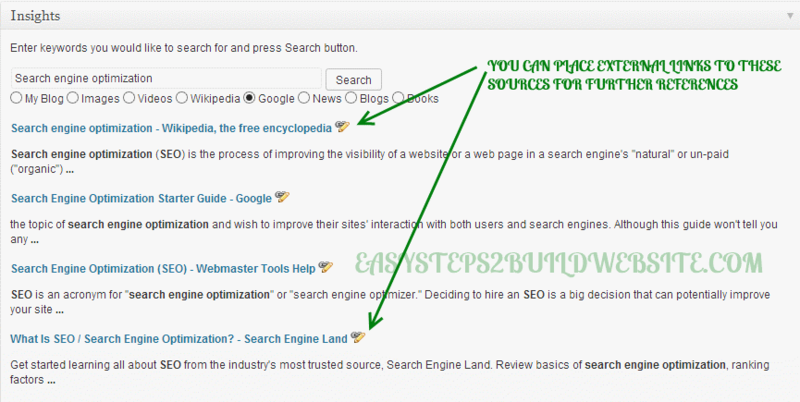 You can explore these options, once you have this plugin installed on your blog. I prefer to use this plugin for above mentioned three features. This is a free plugin, which you can download from any of the below links. 1) From author’s page – Insights plugin. Internal linking is important for SEO. Insights is a free WordPress plugin, which helps you to discover most relevant content inside and outside of your blog and provides a user friendly GUI so that you can link them right away from your editor while writing your post. Let me know how was your experience with this plugin. Also, do let us know if you have any other alternative of this. Share your thoughts via comment! !